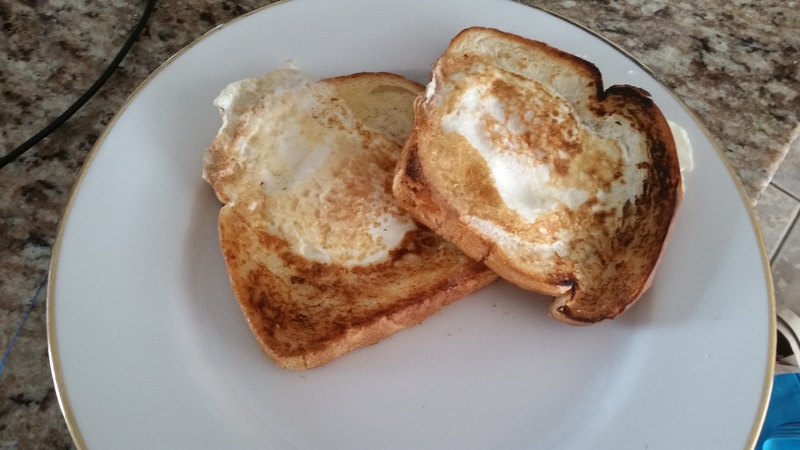 Toad in a Hole – What's for Dinner Moms? My daughter couldn’t wait for me to share this with you. This is her favorite lunch to make right now. I think because it is so simple and she can easily make it herself. She does NOT like the smell of meat cooking or cold sandwiches so to her this is a great compromise. She can have it plain or sprinkle any number of cheeses over the top after she has flipped it over to give it an entirely new flavor. Many people call this different things but to us it is Toad in a Hole. This is super simple and can be customized as you like. When my daughter can make dinner for us in about 15-20 minutes? I love it! Serve with a nice fruit salad to complete the meal. Place griddle or large fry pan on medium heat. Break 1 or 2 eggs into the hole in the bread. If your hole is large enough or your bread is thick you may want to use 2 eggs. Butter second side of bread. When first side is browned and egg is set flip bread over to toast second side. If you wish sprinkle with cheese and cover with skillet lid to melt. Serve hot with choice of toppings or plain. Sounds lovely! In the UK Toad in the hole is batter mix (Yorkshire pudding) with sausages set within. Delicious! Ooo, we will have to try that too. Love this idea for when my little one gets a bit older! Thank you for sharing! Oh, that is sweet that your daughter has her own favorite dish to cook! She likes cooking for herself but hates the smell of meat so this works great! So, she is the vegetarian cook in the family! Pretty much. She has said when she is on her own age will probably be vegetarian. She has never really cared much for meat since she was a baby. That is really interesting. Looking at the bigger picture I wonder where her path leads her. This is really intriguing. Yummy thought to do with the middles. I will have to tell her this! This is a great lunch idea, thank you!